Dr. O.S. Hawkins was the guest speaker at Scottsdale Bible Church on October 6, 2013. I knew this would be an awesome sermon when he began speaking about Christ, and how following Jesus is so counter cultural. Obviously a message we agree with at Team Tait Ministries! Dr. Hawkins set up his sermon by describing the culture of each decade in the United States by summarizing it with one word. The 50’s were a time of gratitude. The 60’s were a time of introspection. The 70’s were defined by skepticism, and so on and so forth. Want immediate gratification. Give it to me, and give it to me NOW. Want something for nothing. There is an entitlement mentality that exists within today’s culture from all socioeconomic groups. Want guilt-free living. This generation still has a conscious, and at the end of the day they strive to feel good about themselves. Thirsty for prosperity, but not certain how to attain it. Ephesians 1:7 – In Him we have redemption through His blood, the forgiveness of our trespasses, according to the riches of His grace. 1. Something Personal – (In HIM) – the answer to their deepest desire to have a meaningful relationship is given to us in Jesus Christ. As Dr. Hawkins said in his sermon, we have 3 relationships in our lives. Outward (relationship with one another), Inward (relationship with self) and vertical (relationship with Christ.) Successful relationship with one another and with self lies in having a successful relationship with Christ. 2. Something Present (we have redemption) – we have it RIGHT NOW! No waiting. When we accept Christ as our personal savior, the joy of Christ is within us. We don’t have to wait for our redemption, there is no initiation. 3. Something provided (through His blood) – The gift of salvation is just that – a GIFT. It is something for nothing. We cannot earn it or deserve it. We don’t have salvation because of the life or works of Jesus – we have it because of His BLOOD. 4. Something profitable (the forgiveness of sins) – When we confess our sins to God, he is faithful to forgive us. The Bible says He remembers them no more. Sin will haunt you, but God will forgive you! We need not live in guilt, because we have the forgiveness offered through Jesus. 5. Something purposeful (according to the riches of His grace) – These are REAL riches. When we realize the grace offered to us, we realize that we have true wealth. It isn’t measured by what’s in our bank account, but by what God offers us! Dr. O.S. Hawkins wraps up this sermon by telling a personal story of redemption that includes a book of stamps and a baseball glove. Listen to the full sermon to hear how he masterfully uses an experience from his childhood to illustrate God’s desire to bring us home to Him! This sermon was fantastic! When it comes to Christianity, our culture has watered it down. That’s why Living Life 180 is defined as Counter Cultural Christianity. Mark and I feel convicted on the importance of sharing the Truth as the BIBLE lays it out – NOT culture. So to listen to Dr. O.S. Hawkins lay out a very well-defined description of today’s culture was great. And to know that YES – we have a way to answer culture’s desires with one Bible verse was extraordinary. What it all boils down to is this: READ THE WORD! All the teachers, all the pastors, all the ministries (Team Tait Ministries included!) cannot replace hearing directly from God. When it comes to building the most important relationship – our vertical relationship with God – we can only do that by having a two-way conversation with Him. When we pray, we are talking to God. But that’s only a one-way conversation, and no one enjoys being a part of those. When we read the Word, we are LISTENING to God. That opens up into a two-way conversation and a real way to build relationship with God. To listen to the full sermon from Dr. O.S. 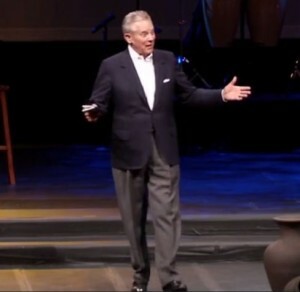 Hawkins at Scottsdale Bible Church, click here.